With deep roots in Arizona farm country, executive chef Jeremy Pacheco brings a country soul to the refined menu he designed for Lon’s Restaurant at Scottsdale’s Hermosa Inn. “Growing up on and working on a farm gives you a great appreciation for what our local farmers and producers do,” said Pacheco. Set in the heart of the Scottsdale desert, the Hermosa Inn was once the home of artist Lon Megargee, whose images of Native Americans, cowboys, and the Arizona landscape have become iconic. “We try to keep the history of art going in all of our dishes,” Pacheco explained. 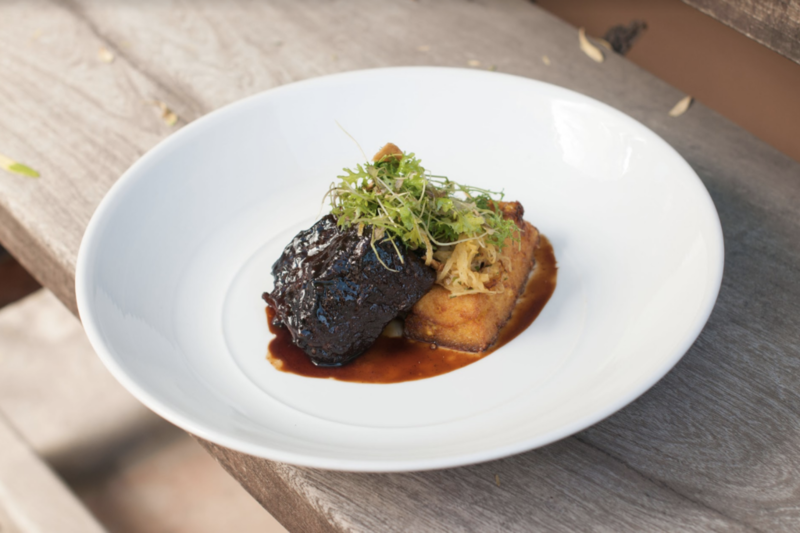 That western flair and artistic touch infuse the chef’s recipe for meltingly tender short ribs served alongside crisp-fried cheddar polenta cakes. Pair these with Old Soul Petite Sarah, which has flavors of blackberry, black pepper, and a hint of caramel. Season short ribs on all sides with salt, pepper, and paprika powder. Heat oil in a heavy pan on medium-high heat and add short ribs. Sear short ribs on all sides and remove from pan. Add onion, celery, and carrots. Sauté for 4 minutes and add tomato paste. Allow tomato to caramelize for one minute, deglaze with red wine and reduce wine until almost dry, then add veal stock and chicken stock. Bring to a simmer, add short ribs back to pan, then add parsley, thyme and bay leaf. Cover with lid or foil and place into a 300 degree oven for two and a half hours. Remove lid and allow to cook for another half hour. Remove short ribs from sauce, strain vegetables from sauce, and serve in 5 ounce portions alongside a cheddar polenta cake. Heat water in a heavy bottom pot, add salt and stir. As water just comes to a simmer, slowly whisk in the polenta. Reduce heat to low and continue stirring to keep polenta from sticking. Keep polenta on at low heat until thick and cooked through—about 30 minutes. When cooked, add roasted corn and remove from heat. In a greased muffin tin place a small amount of the cooked polenta. 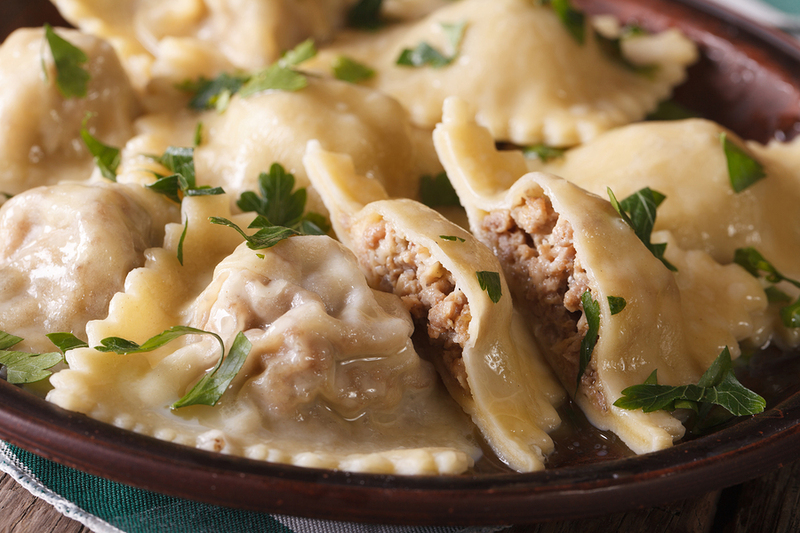 Place cheese curds inside and top with more polenta. Place in refrigerator to set up overnight. When ready to eat heat oil in a heavy pot to 325 degrees. Fry the polenta cakes until golden brown, about 4 minutes.